I must admit I did not expect so many acknowledgments by writing the volatility mimikatz plugin. I want to say thanks to all people that tweeted, emailed - and so on - me: it is just a piece of the puzzle, and the big pieces are those from volatility and from mimikatz. First, I want to say thanks to Andrew Case, for the support and for having tweeted about the plugin: probably all those acks are because Andrew is an uber-well-known DFIR expert! Then I want to say thanks to Kristinn Gudjonsson, my favorite plaso “harsh” reviewer, who spotted some “devil” (you wrote it! ;) issues in my code, as the multiple inheritance I used… lol, I will fix it! Last but not least I want to once again say thanks to Benjamin aka gentilkiwi, who wrote an e-mail to me making the congratulations for the plugin. 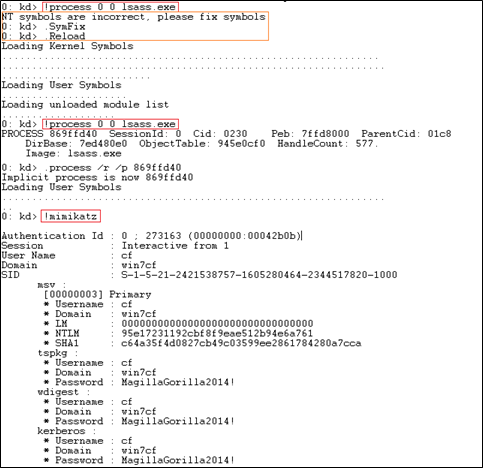 With this post, I want to point out some features of mimikatz that I had not considered in the first instance. Probably this could be the best approach during a pentest: do not send mimikatz on the target, use (for example) sysinternals procdump. Then, create a crash dump for the lsass process (pay attention to specify the right parameters) and get it on your machine. You’ll get all the info! Awesome! 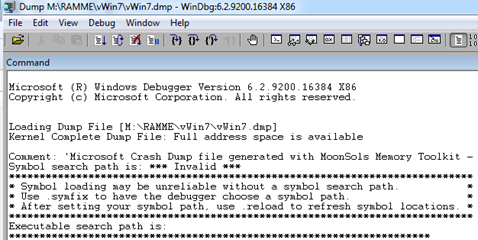 Just a quick note: use mimikatz on a platform of the same major version and same architecture as the original dump. The following image comes from his blog. In my previous post I asked “How to do the same during post-mortem ultra-died forensics?”. Well, you can use mimikatz if you have a Windows OS! How? Benjamin explained it, and I followed his instructions to get the job done. 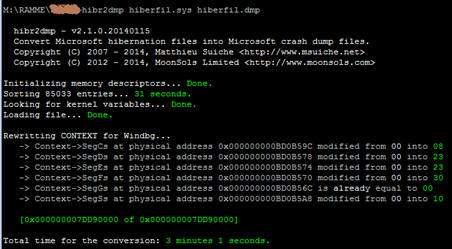 First, you have to convert your memory dump or hiberfil to a windows crash dump: you can do with the immense volatility or with Matthieu Suiche’s memory tools (bin2dmp and hibr2dmp). Then, launch windbg (better if with the right architecture… x86 or x64 depending or your target) and load the target crash dump (note: I changed the target, a Windows 7 SP1 x86). At this point you have to load – guess what? 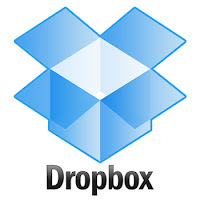 – mimikatz, and specifically mimilib.dll. It will even provide the instructions for the next steps! Follow the instructions (red square in the next figure, pay attention to symbols) et… voilà! Logged users’ credentials. You can even work with VmWare vmem files! Let’s say that’s awesome! Finally, some considerations. mimikatz or volatility? 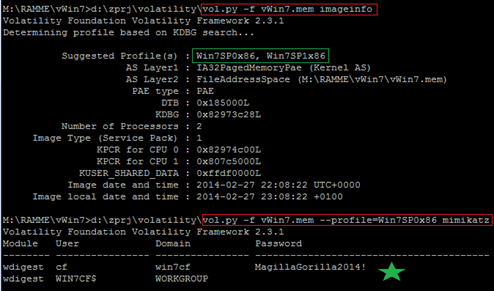 mimikatz AND volatility! Finally, you can achieve the same result directly with mimikatz and without volatility. Which is the best approach? It depends: actually mimikatz+minidump are Windows only, so, if you are working with another OS, volatility+mimikatz plugin is the way, unless virtualization. Besides that consider that the engine (I mean signatures and data structures) is the same: I have an idea to add, and I will share it with Benjamin, so they should be aligned. If in Windows, it’s up to the user. 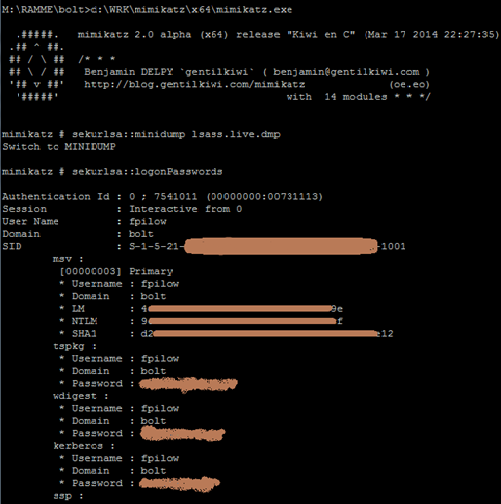 Some people wrote to me asking how to use the mimikatz volatility plugin. Remember, it’s a PoC, anyway, this is how I’m using it.